I’ve read all sorts of rhetoric about staying in the now as well as the importance of keeping ourselves in a present state and while I do buy into it due to the amount of peace and clarity it creates, it’s not often that we are given direction on how to achieve this. Many different systems of belief expect us to partake in all sorts of mystic like behaviour in order to experience this mind clearing and solace bringing experience, but it really isn’t needed. As an example, some folks out there insist that Chakra healing practices are necessary and while they are beneficial, they will only provide temporary relief if we can’t get the root of the problem and get our heads on straight. If our thoughts are rampant and full of anxiety and worry, we will clog right back up again. We have to yank these weeds out at the root in order to clear our own personal gardens. It is the only way to bring about a permanent, long lasting change. 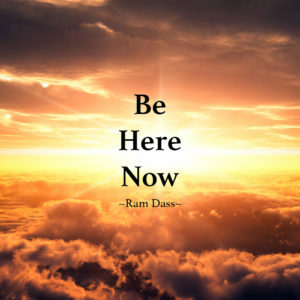 Being in the now is really nothing more than a state of mind. It’s when we are most open to our surroundings and are not plagued with countless thoughts that work to discourage our current efforts. It is when we experience clear and concise insights that help us move forward and when we finally have the ability to find new inspiration in even the most innocuous things. There truly is beauty all around us if we take the time to pay attention to it, but most of us get so wrapped up in our day to day lives, we almost feel guilty for letting the influx of thoughts go. How often do you find yourself working on something, but end up losing momentum because you can’t stop thinking about everything else you need to get done. Most everyone I know wants to experience productive days that end with a sense of accomplishment, but if you can’t stop thinking, chances are you won’t get anything done at all. Our minds truly have the ability to be our biggest enemies when we let them. Most of us are always trying to plan for what comes next in order to avoid future frustrations, but constant planning coupled with a lack of action on current matters absolutely ensures stagnancy and stress. It’s easy to get so wrapped up in fears and worries that nothing ends up getting done at all. Once that happens, we have dug an even deeper hole and it’s going to be more difficult to climb out of it come tomorrow. Then, the cycle repeats and all sorts of nasty emotions begin to surface. It’s a hole that too many, myself included, have been down countless times. Meditation is a quick way to get present, but it does differ what I’m writing about today. In my Intuitive Development program, I provide methodology that helps to ensure a present state in both meditation and in our regular waking world. This allows students to be much more cognizant of the subtle energies that surround us and provides them with an opportunity to gain insight and direction in the process. This ensures a much calmer existence and days that are more productive than we may have ever dreamed possible. Even if you aren’t interested in bringing your latent abilities to the surface and opening yourself up to a different world, at least work on getting yourself in a present state. You won’t win if you aren’t there. Below, please find a quick and easy process to help you achieve this state right now. You deserve peace in your life and you deserve to accomplish everything you set out to do. Let’s issue an immediate moratorium on the constant influx of thoughts that plague us all right here, right now. First, stop everything you are doing. While I understand this seems completely counterproductive, just trust me on it. Take a look around you. What do you see? What do you notice that’s different? What do you feel? If you feel guilt, it’s because your mind is already racing and you are already starting to worry that you are wasting time and not getting anything done. It could even chain react at this point and make you believe that doom and gloom is right around the corner if you don’t get back to work right at this very second! But, try to pay attention to what you are seeing. Focus in on every aspect of it and allow all of your senses to experience it. This doesn’t mean you have to run around and start licking things, but you can imagine what it would taste like. Allowing all of our senses to come to the forefront is a quick way to shut down the mind and is especially useful when it starts having a tantrum. It makes no difference what it is. For me, I go outside and pay attention to nature. I immerse myself completely in my surroundings and in the process, think of nothing else. Achieve that state of nothingness and just let go for a minute. Once you’ve developed that feeling, you’ve experienced a present moment. There were no worries, there were no burdensome thoughts and for just a second, everything was perfect. This is the state you want to aspire to constantly be in. The more present you are, the more you will accomplish. While this may seem like a simple distraction technique, I can assure you it’s actually much more because the more you develop it, the more you will experience the peace and clarity needed to accomplish anything you set out to do. Utilize this same method when you are working on a project. Rather than worrying about whether or not you are going to get it done or stressing over the fact that it might take up too much time and inhibit you from picking up the kids on time, just let go and focus. Feel every bit of it and think of nothing else. Give all of your attention to the task at hand and you will likely get it done much faster than you expected and start regularly producing higher quality work that you are proud to call your own. Lastly, practice, practice, practice! The savage beast between our ears, in most cases, cannot be tamed overnight but you will eventually get there. Are you struggling to quiet your mind and immerse yourself in the moment? If so, check out my services. A simple reading or development session may bring you the clarity you deserve.